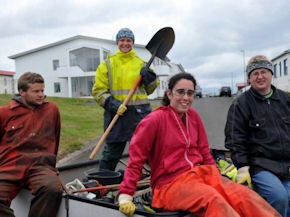 Volunteer project: Our host for this project is a farmer’s family on the south shore of Iceland close to the town of Vík. The farmers cultivate carrots and keep cows. 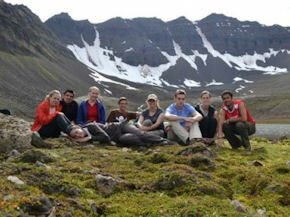 This is the 7th year that volunteers will have the unique opportunity to get to know and explore this traditional Icelandic farm. There will be various environmental tasks, such as tree planting and tree cutting, helping with the upkeep and the restoration of some farm buildings, helping cutting the grass used to feed the animals during the long winter months and assisting with other farm related work. We may also help repair environmental damages after animals. Other possible tasks include turfing grass; cleaning tasks, such as clearing fields of rocks, fences and beautifying the area, like hand-picking garbage or collecting trash that has been blown by the wind. Those interested in farm activities can help out taking care of the animals or carrots cultivation. Participants are invited to the stalls, and can assist in milking the cows if interested or just tending to them in general. The work can be demanding and requires a good physical condition but no previous experience is necessary. The working day normally runs from 9am to 5pm with breaks for lunch and coffee; however, please be prepared for some flexibility due to the unforeseeable weather in Iceland. As it is outdoors work, volunteers shall be ready to adapt and be flexible with the working and free-time schedule, as depending on the weather, we may not be able to perform some of the tasks or activities planned. Leisure time: Our host will organise free time activities in the area, depending on the weather conditions. Accommodation: The volunteers will stay in an equipped flat, in a sleeping bag accommodation sharing rooms. Please bring your own sleeping bag. Location: The farm is located in the South of Iceland, in a beautiful area surrounded by mountains and glaciers to the north and facing the Atlantic Ocean to the south. The closest town is Vík. The inhabitants here live in constant threat of volcanic eruptions and the area was covered by ashes during the recent eruptions in Eyjafjallajökull 2010 and Vatnajökull (Grimsvötn) 2011. Vík is Iceland's southernmost village. Mýrdalur is bordered by the glacial river Jökulsá to the west and the river Blautakvísl to the east. Its northern border is the Mýrdalsjökull glacier, which caps the volcanic Mt. Katla, while its southern limits are black sand beaches and the rolling Atlantic waves. The district lives mainly by agriculture. Although this community of 600 inhabitants faces the open Atlantic, Vík is the only seaside settlement in Iceland left without a harbour due to natural circumstances. Among the many attractive aspects of Vík, are the trips to the South shore and to Mýrdalsjökull glacier.